This manuals primary aim is to provide explanations, examples and exercises for those preparing for the Linux Professional Institute (LPI) Certification Programme 1 (LPIC-1), Exam 101. Its LPI-Approved Training Materials (LATM) criteria. 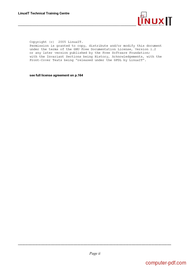 The Linux Documentation Project (LDP or TLDP) Author Guide (AG). The content herein is designed to accompany practical courses preparing for the LPI 101 exam of the LPIC-1 programme. While this material was generally structured to work with a course of 24-32 hours in consecutive 8-hour sessions, it is modularized to also work for shorter or longer sessions, consecutive or otherwise. Description : Download free course Study Guide for Linux System Administration 1 Lab work for LPI 101, PDF book made by LinuxIT. It is never too late to start learning and it would be a shame to miss an opportunity to learn a tutorial or course that can be so useful as Linux System Administration 1 (LPI 101) especially when it is free! You do not have to register for expensive classes and travel from one part of town to another to take classes. All you need to do is download the course and open the PDF file. This specific program is classified in the Unix-Linux OS category where you can find some other similar courses. Thanks to people (like you?) Who share their knowledge, you can discover the extent of our being selected to easily learn without spending a fortune! 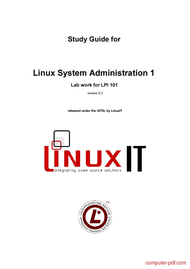 Linux System Administration 1 (LPI 101). is available for free by its author. But also many other tutorials are accessible just as easily! The latest news and especially the best tutorials on your favorite topics, that is why Computer PDF is number 1 for courses and tutorials for download in pdf files - Linux System Administration 1 (LPI 101). and Unix-Linux OS! Download other tutorials for advice on Linux System Administration 1 (LPI 101). you will see! We will do everything to help you! And you dear surfers what you need? The best course and tutorial, and how to learn and use Linux System Administration 1 (LPI 101). of course!